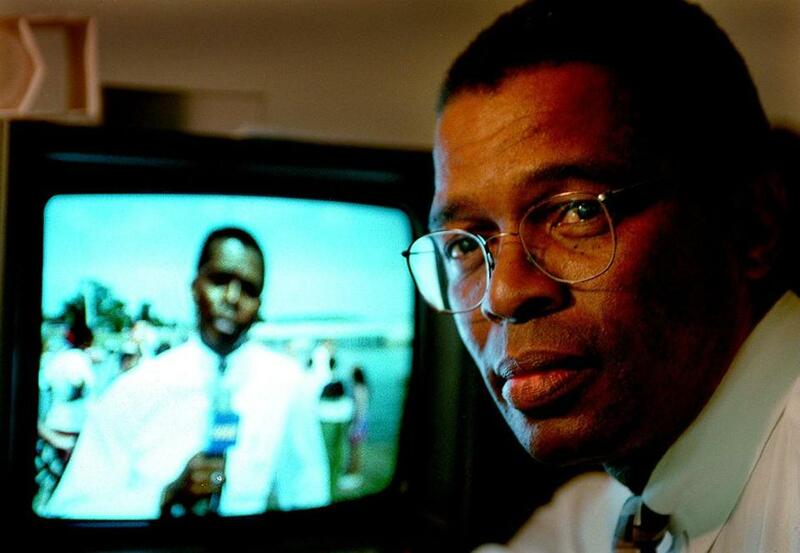 Charles Austin reported on major moments in Boston and world history during more than 30 years as a WBZ-TV reporter, but arguably the most compelling story he shared with viewers was the example of his own life. Aneurysms, a stroke, prostate cancer — nothing could mute Mr. Austin’s voice. A trailblazing African-American in Boston’s broadcast media, he was honored for his reporting, for his work promoting health awareness, and for being a mentor to those who followed in his footsteps. Mr. Austin, who was 73 and lived in South Dartmouth, died Tuesday morning. “People trusted Charlie and Charlie trusted them, and that’s how he found his way into some of the most memorable stories in Boston — and, frankly, beyond,” said Peter Brown, a former news director at WBZ. For us in this ego-driven business, he set a high bar and a marvelous standard: you don’t have to be a jerk to be good. In fact, if you’re a jerk, you’ll never be as good as you should be. Mr. Austin received an Emmy in 1970 for a documentary studying violence in Africa, and a Gilda Radner Award in 1997 for his inspirational role as a cancer survivor. Mr. Austin, whose daughter Danielle was born with Down syndrome, also was inducted into the Massachusetts Special Olympics Hall of Fame. Challenges such as the ones he faced could not be faced alone, he said. “I am not Superman. I’m a normal man of doubt, but strong of faith, and yes, it’s been tested with Danielle, aneurysm, stroke, and now cancer,” Mr. Austin told the Globe in 1995. As an African-American in Boston’s nearly all-white TV media world, “he paved the way for so many,” said the Rev. Liz Walker, who arrived at WBZ after Mr. Austin and became the station’s first African-American news anchor. “But that is overshadowed by who he was. Charlie Austin was an incredible man of strong moral fiber. He wore his faith on his sleeve and it worked perfectly. It affected his reporting and it affected his life. I look at him as the man who reintroduced me to faith,” said Walker, who is now pastor of Roxbury Presbyterian Church. Possessing a wide range of talents, Mr. Austin was at ease in front of the camera and on a stage. He was singing with the Grace Chapel choir in Lexington in 1992 when he joined the cast of “Black Nativity,” the musical based on a Langston Hughes play that the legendary Elma Lewis produced under the auspices of the National Center of Afro-American Artists. Mr. Austin often said the three most memorable events he covered were the Charles Stuart murder case, the 1980s famine in Africa, and the story of Jamie Fiske, a young Bridgewater girl who needed a liver transplant. He accompanied her family to and from Minnesota for the surgery. Mr. Austin’s journeys to Ethiopia and Sudan to cover the famine were unforgettable. “I have never ever seen that much pain in humanity in my life. Ever. Anywhere,” he said in a 2011 interview posted on the South Coast Today website. The youngest of four, Charles K. Austin was a son of Charles B. and Marion Austin. In her later years, his mother was a well-known humanitarian, opening orphanages and a school in Haiti. When Mr. Austin graduated from high school in Ayer, a guidance counselor tried to steer him toward mechanics, saying: “It’s a field your people do well in.” But teachers who had heard him sing pointed him toward New England Conservatory, where he earned an acceptance by auditioning with a bass solo from Brahms’s Requiem. He also began singing with folk groups and left school to perform in New York City and on the road, opening for the likes of Nina Simone. While gigging and working in St. Thomas in the Virgin Islands in the mid-1960s, he met Linda, his future wife, who was on vacation. They married in 1967. As an interracial couple, they often faced racism — from North Carolina, where he was stationed while in the Army, to Greater Boston. “In our hometown, Lexington, there were times Charlie was stopped by police for absolutely no reason whatsoever except that he was a black man,” she told the Globe in 1995. After convalescing, he went to WBZ looking for a job. The station first hired him as a film processor. During his first week, Martin Luther King Jr. was assassinated. He retired in 2000 and was inducted in 2011 into the Massachusetts Broadcasters Hall of Fame. He also received a Silver Circle award from the New England chapter of the National Academy of Television and Sciences for his contributions to the medium and those entering careers in the field. A service will be announced for Mr. Austin, who in addition to his wife, Linda, and daughter Danielle, who lives in Fairhaven, leaves his daughters Lisa Coole of Bridgewater and Amy Sheppard of Madison, N.J.; a sister, Adrienne Mack of Winchester; and five grandchildren. Marquard can be reached at bmarquard@globe.com.